Weather a factor in the Solar/FC Dallas game? Who expected that one? soccerman1994 wrote: I watch the video a couple of times. The player ran right thru her. No attempt to play the ball. But I also seen a lot worse from OEFC. I completely agree. That kid knows she is physically dominant and uses it to her advantage. She also has some very good skill and really doesn't need to play dirty. Physical play is fine as long as there's a simultaneous effort to play the ball rather than just drilling the kid first and playing the ball second. I watched the full video and that's how she operated the whole game. She even brings the pain when she has the ball and got called for a foul in the first half for that. Kids grow at different rates and she won't be able to physically dominate so many players for too much longer. Meanwhile, the refs need to do a better job of helping the players learn the difference between hard, physical play and dirty, physical play. I don’t expect DA team to win DIGC. I only heard the final score. Do not know any of the details of the game. Yes. This I will have to hear. Cheers Albion for beating the No 1 DA team in the Country ! But not even top 3 in north Texas in my book . Dont expect DA team to win DIGC. 4-4-2 wrote: Cheers Albion for beating the No 1 DA team in the Country ! But not even top 3 in my books in north Texas. #1 DA in the country? What about any of the other games that have played and scores have not been entered. These Texans put on a crappy tournament. Standing by, anxiously awaiting the LPE/FCD DA game. Potential for NTEX Soccer chaos. So on this board a few weeks ago didn’t someone post about FCD losing a couple girls? You sure that wasn’t okie energy making excuses for losing? 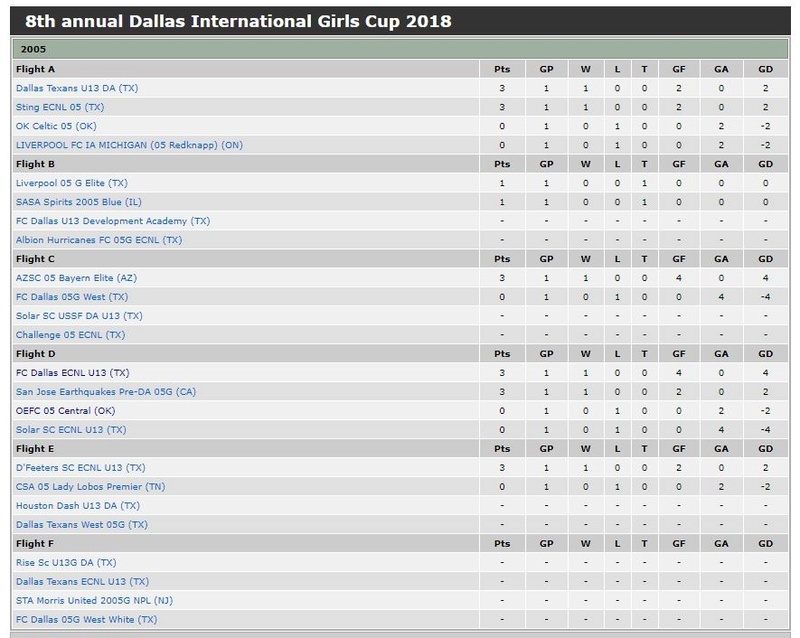 FCD 05 DA did lose a player over the break. They aren't the #1 DA team in the country ... not even close really. Just lost a league match to Solar DA too -- c'mon guys. In this morning's match, FCD were up 1-0 at half (err ... 15 min in). Albion scored 2 in 2nd ... 1v1 due to a back line breakdown and beautiful header off of a corner. I thought it was FCD DA but i remember thinking why would anybody lose a player or two in Jan. Okie has already used that excuse anyway. Next up? The players were bigger and more physical. Oh wait he already used that one too. Haha. You forgot about the flu. It was the flu I tell ya. Big Ern wrote: FCD 05 DA did lose a player over the break. I do think they were at one point though. Given a post I saw last year. ColtMcVince wrote: Haha. You forgot about the flu. It was the flu I tell ya. Probably the parents cocktail flu! 4-4-2 wrote: Cheers Albion for beating the No 1 DA team in the Country ! But not even top 3 in north Texas in my books . Twice huh 4-4? Why you're as giddy as a school girl with ringlets aren't ya compadre? How 'bout next you tell us about yours "books"
Why did they lose a player? Just curious. The one I heard about was their stud from OK ... mom got a job in TN. Let Big E's defense commence . . .
That actually rings a bell now. She was good. Guess she will be a Lobo now.